"The Past, The Present & The Future in The Northern Forest!" The past, are of photos of the three pups from last years breeding with Cobalt & Tony. The photos were taken two weeks past at Rosaire's kennel. That was one of the most uniform litters I have ever bred. The present, the due date for Teal & Tony puppies has come & past with no pups so far. The Future, only time will tell if there is going to be pups from this years breeding! This was a wild week here weather wise with some late day storms, which produced strong wilds & heavy rains. The dogs enjoyed the cooler weather; however, the rain also stimulated the activity of the Black Flies. With the help of a product called "Swat", the dogs are not being bitten by the flies. A new add. 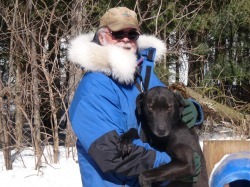 was placed on Sled Dog Central for a second Handler/Trainee for this coming training/racing season. If anyone is interested in the position, please contact me. In the mean time, the puppy watch continues!